SAO PAULO -- Tens of thousands of Brazilians took to the streets Saturday in protest against the presidential front-runner, a far-right congressman, Jair Bolsonaro, whose campaign has exposed and deepened divisions in Latin America's largest country. In Sao Paulo, Rio de Janeiro and Brasilia, people flooded avenues and squares to sing, dance and shout "Not him!" - the rallying cry of groups who are trying to prevent Bolsonaro from taking office in October elections. The protests came the same day that Bolsonaro was discharged from a Sao Paulo hospital where he received treatment after being stabbed during a campaign rally on Sept. 6. On Saturday evening, after flying home to Rio, he tweeted that there was "no better feeling" than to be close to his family. "We're saying to those people who are undecided: Not him," said Selia Figueiredo, a 43-year-old banker in Sao Paulo, who said she worried for her rights as a gay woman if Bolsonaro were to win. They can vote "for anyone else, but not him." In the heart of Sao Paulo, Brazil's largest city, leftist presidential candidate Guilherme Boulos and his running mate Sonia Guajajara led the march, while people beat drums and waved gay pride flags and banners that denounced Bolsonaro, who is known for offensive comments about gays, women and black people. In downtown Rio de Janeiro, a crowd that was heavily women shouted: "Sexists and fascists won't advance!" Bolsonaro's candidacy has attracted international attention as an example of the trend in many countries toward populism and extremes in politics, and small protests were held against him in London, Lisbon, Berlin and Paris. His support is particularly thin among women, who led the protests against him Saturday. According to a recent Ibope poll, 36 percent of men surveyed said they would vote for Bolsonaro, while only 18 percent of women supported him - an unusually large gap. Bolsonaro's campaign has both benefited from and contributed to the political divide by focusing on culture-war issues and "traditional" family values. He hasn't tempered his rhetoric during the campaign and has kept up his praise of Brazil's two-decade military dictatorship. He has also promised to give police permission to shoot first and ask questions later. Saturday's protests were led by women's groups and others who said they rejected his divisive rhetoric and feared he would make life harder for minorities of all stripes. "Being here means saying no to sexism and to hate," said Lidia Ferreira, a 46-year-old literature teacher. "Bolsonaro as president would be a tragedy for the country. A handful of smaller rallies were also held in support of Bolsonaro on Saturday. One of his sons tweeted a video of dozens of women in pink shirts singing his name in front of the opera house in the Amazonian city of Manaus. Another son tweeted a video of around 100 women who were identified as Evangelical leaders, saying "Yes him, Bolsonaro represents me!" 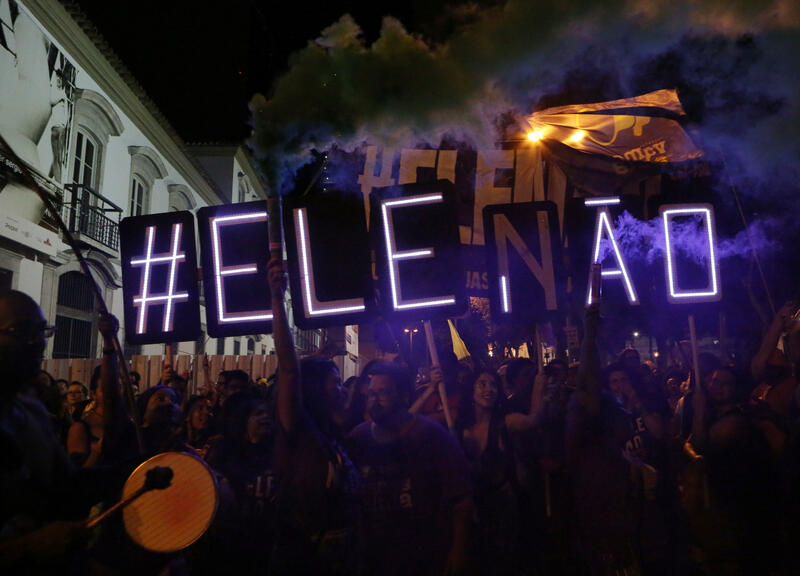 Bolsonaro's "tell it like it is" attitude has gained traction among voters who are angry at the political establishment. Despite his decades in Congress, they see him as a no-nonsense outsider who can rid Brazil of corruption and high crime rates. He has particularly drawn support among people who are disgusted with the left-leaning Workers' Party, who governed the country much of the last decade, and want to prevent its return to power at all costs. "People think Bolsonaro is an economic alternative to the last governments. He's not," said Sandro Gandur, a 31-year-old lawyer at the protest in Sao Paulo. "This might be the main area for (changing the minds of) people who are inclined toward him but are uncertain."